Rollie Heitz wasn't supposed to be the winemaker of the Heitz family. His brother went to enology school, whereas Rollie got a finance degree. "The idea was to work at the family winery," Rollie says. Yet now here he is, making wine, in a converted house down a winding lane just south of Calistoga. Rollie's winery is called Midsummer Cellars and it's tiny, rolling out just 1600 cases a year. The winery his father founded, Heitz Wine Cellars, has a prime location on Highway 29. 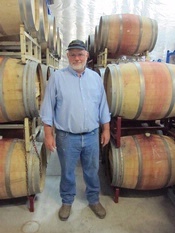 Rollie's brother David is still the winemaker, while his sister Kathleen is the president. Rollie left the family business in 1997 after 18 years to work for Robert Keenan Winery, but he quickly decided he wanted to run his own show. Rollie, 55, worked alongside his father Joe Heitz for long enough to absorb some of his ideas. His red wines are all pure Napa Cabernet, Joe's favorite, and all single-vineyard. "I don't like the overly tannic Cabernets," Rollie says. 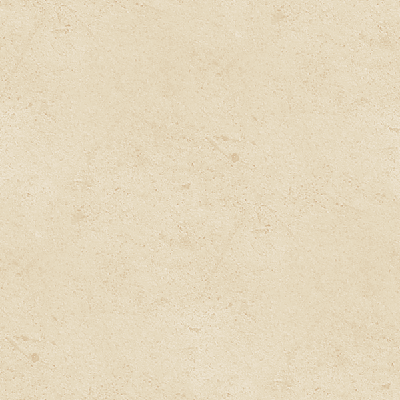 "I want something that's approachable at release, but still has the tannic structure." And perhaps this is the way Joe Heitz worked at the beginning of his career, on a very small scale. "Our fermentation temperatures are close [to his father's]," Rollie says. "We try to get them real cold to start. But it's so different because we're fermenting 200 gallons. Trying to replicate a large tank in a 200-gallon T-bin is impossible." This is the way things go in Burgundy: You see many bottles with variations of the same last name, often hyphenated, as inheritance laws split up the prime vineyards into one row for this son, one row for that daughter. But you don't see it so often in Napa Valley, and especially from a famous name like Heitz. There's either more story here than I know, or less: Maybe nothing so dramatic as the famous fistfight with his brother that prompted Robert Mondavi to start his own winery and change Napa Valley forever. Maybe they argued over the prime parking space. I don't know; Rollie didn't say. In any case, this is not Burgundy, because Rollie's name isn't on the winery, and the name he chose is so generic that at first I assumed it was a private label wine made by one of the big companies for supermarkets. 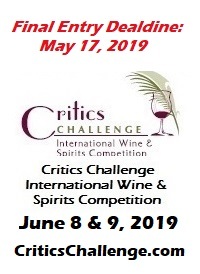 I discovered Midsummer Cellars from a blind tasting earlier this year at Critics Challenge, when its 2010 Cabernet Sauvignon from Cañon Creek Vineyard won Best of Class Cabernet, with my enthusiastic support. 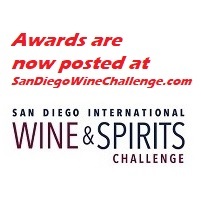 It's an elegant, sophisticated wine and was in the running for best red wine at the competition. This is not a supermarket-wine company. I emailed the contact address on the website, and Rollie himself got back to me, as he does with everyone. It's a small operation: He drives the forklift, he answers the mail. And he's a very down-to-earth host. On the day I visited, four customers were eating a picnic lunch they'd brought on the patio. 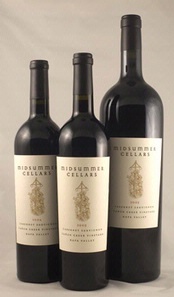 They hadn't heard of Midsummer Cellars either, but it was on a limousine tour of small Napa wineries that they had considered booking before deciding to drive themselves around (the limousine company was pissed). Rollie gave them the nickel tour: The outside tanks, the vineyard behind the place, the small barrel room he shares with another winery. It's nothing fancy there: No space-age technology, no merchandise. That was exactly what they wanted. "At most wineries, you talk to somebody in the tasting room who's just an employee," one woman said. "Here we're talking with the owner." As you can tell from the paucity of quotes here, Rollie's amiable, but not forthcoming. I couldn't find his story elsewhere on the Internet, and having met him, I think it's because he's not anxious to tell it. The best story he told was of evicting a horse. He and his wife bought the property near Cañon Creek in 1989 and lived in the house there. This was in between Napa land booms, so they could afford enough land for their daughter to keep a horse. They also had enough land for a vineyard, but while Rollie worked at the family winery, he didn't need a home-ranch vineyard, so he didn't plant it. Once he left the family company, though, he needed to plant. "We didn't evict the horse for 10 years," Rollie says. "But then we had to give my daughter the bad news." Rollie had been making wine there, but earlier this year he moved to the converted house he shares with another small vintner, Glen Cook, who's retiring. They share a barrel room, but Rollie has the run of the production facility. He sells most of his wine direct to consumers, but does have some wine in distribution in two distant but related areas: Lower Manhattan and Santa Fe. About half of his total production is rosé, a pale, lean, crisp wine he makes from Grenache and a little Viognier from a vineyard in Yolo County. It's a refreshing wine on a Calistoga summer day. And he started making a few cases of a Rhône white blend. But the three single-vineyard Cabs are his meal ticket, and the wine from his own vineyard at Cañon Creek is the highlight: Well-balanced, with plenty of black raspberry fruit and a nice fresh herb note. Perhaps the Cañon Creek property was great horse-housing terroir, but Rollie Heitz has put it to a more flavorful use.